I had another opportunity to actually go out for dinner at work again and I really wanted to take advantage of it. 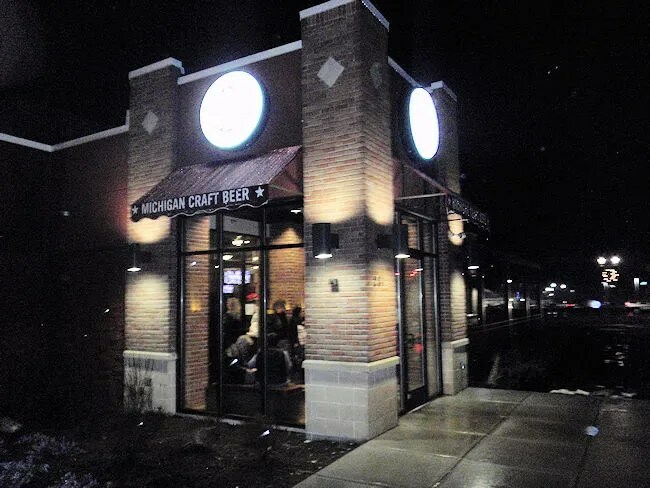 I read a few weeks ago about a new “Burger Tavern” opening up in Cascade Township and I’ve read some good reviews out of the Lansing location, so I was really excited to check it out. 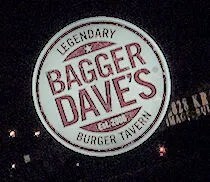 Bagger Dave’s Legendary Burger Tavern is a new chain concept with roots in Southfield. Diversified Restaurant Holdings, Inc. opened the first Bagger Dave’s in Berkley in 2007. They’ve opened five more including the one in Grand Rapids. They have just started franchising with the first franchise restaurant set to open in Cape Girardeau, MO. The restaurant is set up like any one of the other casual dining chains. I didn’t get a good look or feel for the place because I placed my order online for carry-out. The parking lot was packed when I showed up to pick up my order at quarter to seven on a Friday night. Likewise, the waiting area was packed as well. There looked to be about a twenty to thirty minute wait when I showed up during peak dining time on a weekend. Since my order was already called in, I sort of pushed my way through the crowd to get to the carry-out counter. I stood there for a few minutes before a waitress noticed that I was not part of the waiting crowd. She came over and asked for my name. My order slip was sitting right on the counter so she pulled it and rang up my order. I ordered online, but the payment system was down so they had to run my card. I handed it over then filled out the receipt as the waitress headed to the kitchen to get my brown paper bag of food. There’s a burger on the menu called The Train Wreck. It comes topped with french fries, a fried egg, Cheddar cheese, onions, mushrooms, lettuce, and the Railhouse Burger sauce which they compare to a Thousand Island dressing. As much as I wanted to, I didn’t order this burger. Instead, I stuck to the Create-Your-Own option. Your options are Lean Ground Beef, Fresh Ground Turkey, or Veggie Black for the patty. I chose the beef which is two patties of fresh USDA Midwest premium beef. The base price doesn’t include cheese or premium toppings. 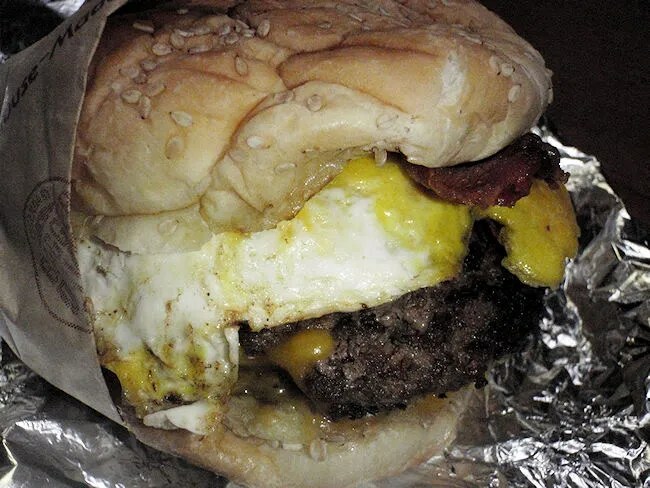 It does include choice of sesame, honey wheat, or a plain bun as well as a choice of sauce and a whole host of “meaningless free toppings.” I chose the sesame seed bun and topped my burger with Mild Cheddar Cheese ($.80 extra), Applewood Smoked Bacon and a Fried Egg (an extra $1.00 each). The burger had a really good crispy, smokey flavor and it was fall apart tender and juicy. The cheese was melted between the layers of beef and the fried egg added even more of the greasy flavor that I love on burgers. I kept things simple because I really wanted to taste what Bagger Dave’s offered up in a burger since it is the star of the show and I was quite happy. There a number of toppings (including the option to add fries) that I would still like to experiment with and since ordering is so simple through their website, I will file this one away hoping to get to try more of the menu. By looking at the menu, it didn’t appear that the sandwiches came with fries, so I added an order of Fresh-Cut Potato Fries with Sea Salt. I figured worst case scenario, I would get two orders. That didn’t happen. I only got the one I ordered, so I’m left to assume that fries are a la cart. 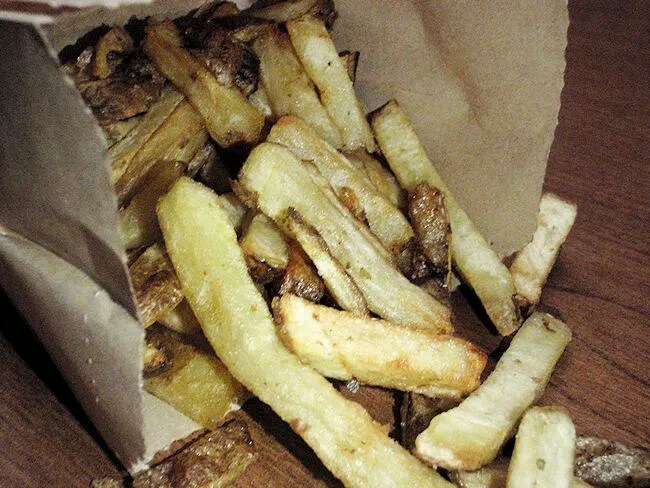 The product descriptions describes Bagger Dave’s as using a “Seven-Step Belgian Fry Process.” The fries I got were incredibly delicious. They were fresh cut with the skin still on with a healthy dusting of sea salt. They were pretty soggy though which was a little disappointing. The seven step process usually makes them a little crispier. I was also a little disappointed in the portion size, so next time I’ll know to get the double order. My first experience with Bagger Dave’s was a positive one. The food was delicious. The price was a little high with the a la carte ordering. Without a drink, the fries and burger cost me a little over $10 which is actually on par with a lot of the newer gourmet burger joints. Being a lover of burgers, I hope Bagger Dave’s takes off. It will definitely give Red Robin a run for their money.